Where this idea came from? The credit for this idea goes to the work by Helene Polatajko, OT. 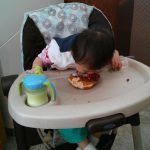 She is an OT that works as a research, educator, and clinician with children with developmental coordination disorder. She developed the Cognitive Orientation to daily Occupational Performance model (CO-OP), which is a cognitive-based intervention approach to improving occupational performance. Learn more about Helen Polatajko from The American Occupational Therapy Foundation. 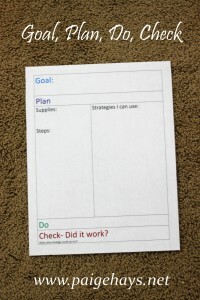 Teaches children to use a global strategy of Goal-Plan-Do-Check. In practice, this means to set a goal, make a plan, do the plan, then check if it worked. 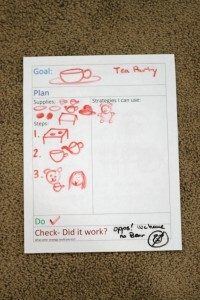 Focuses on guiding children to find their own solutions to what they want to do. It is about the process, not the result. Helps to build initiation, organization, planning, self-monitoring, and self-correction. The global strategy gives a structure for all tasks, then specific strategies can be used on specific tasks. Guides them to find strategies that can then be generalized to other goals and problems. Evidence-based approach that is based on motor learning, cognitive behavioral, and problem-solving theories. Has been used and studied with children with developmental coordination disorder, cerebral palsy, attention disorders, autism spectrum disorder, and brain injuries. 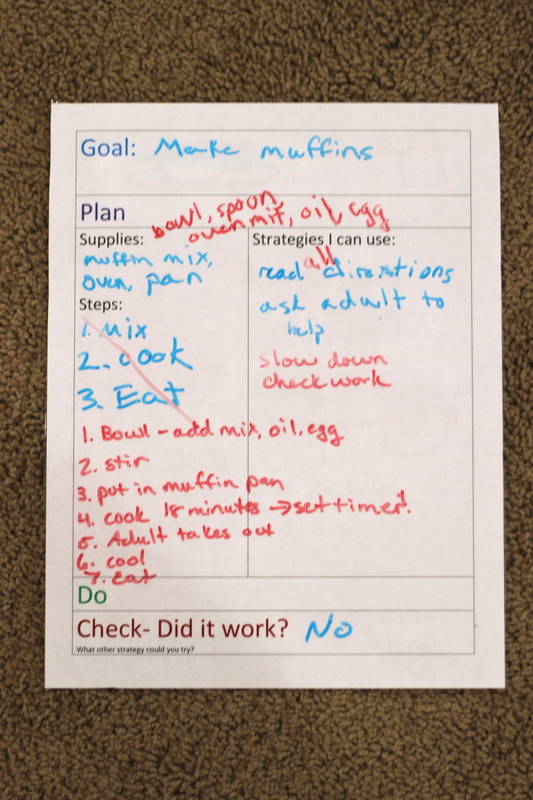 Nearly all daily tasks and play activities in childhood have a goal, so using a strategy to teach children about identifying and achieving goals should fit naturally into daily routines and play. It isn’t about doing a specific problem-solving task, but instead about applying a problem-solving and goal-oriented approach to all things. This is a key part of building executive function skills- to learn more, see my previous posts. 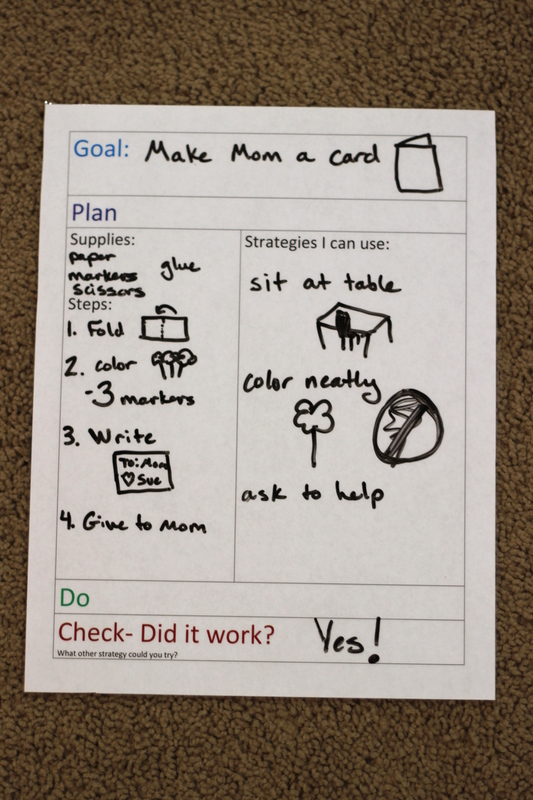 Make a visual to help both the adult and child follow this outline. 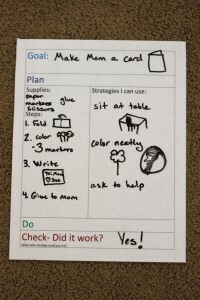 As it feels more comfortable, a white board or even just a sheet of paper can work. For older children, verbal cues may be enough. 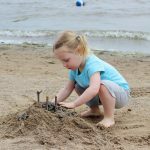 Start giving the child responsibility for one part of the process. Maybe it is that they first need to come up with the goal (“What should we paint today?”). Next might be having the child state the plan by writing down the steps of the task. As children gain skills, the adult can provide less support. 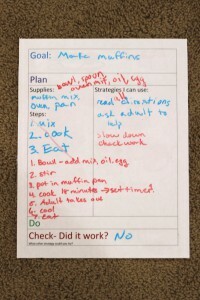 Work up to having the child be responsible for the majority of the outline, with adult support mainly for checking work and generating new strategies as needed. I’ve included photos of real life examples below, click on each to see more details. Simple visuals for younger children. 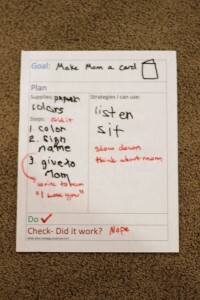 Focuses more on following steps to complete a task. 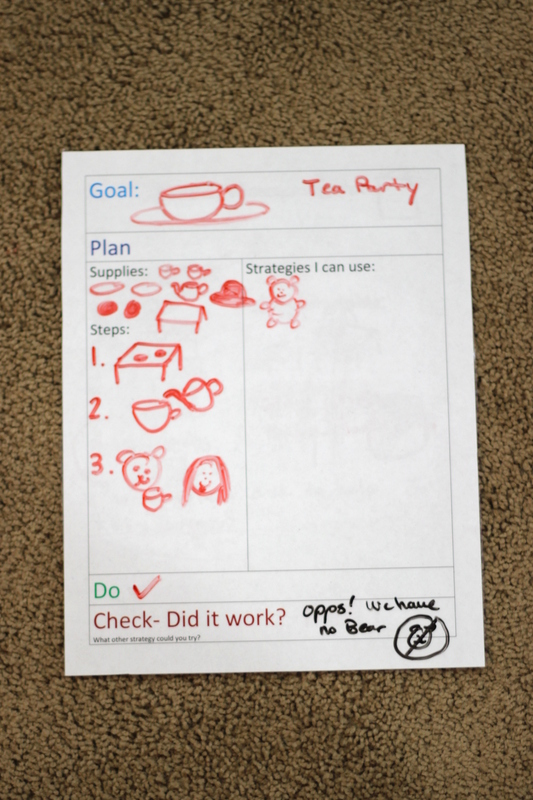 Preschool version- starting to use strategy to help with monitoring work and improving quality of work. 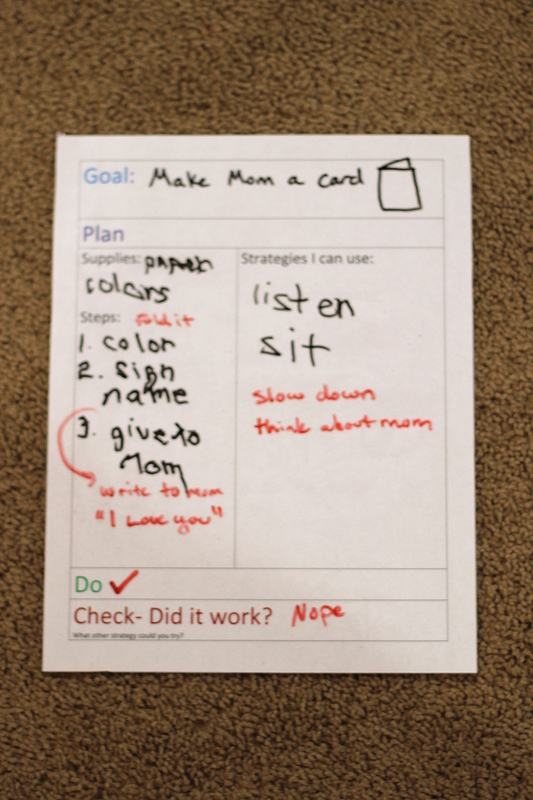 School age child starting to write out his own plan, focus was just on thinking before taking action. More complex example from an older child. Working on noticing details that are needed in a plan, lots of time spent checking work and revising the plan rather than giving up. 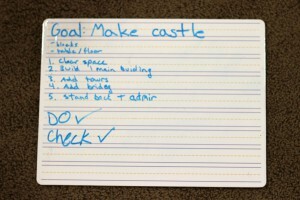 After lots of practice, this child could use Goal, Plan, Do, Check with minimal help, but still needed to write it down to stay focused.